Below you will find the letter I sent out to my friends and family to seek support for a mission trip to Coahuila, Mexico. I was blessed with a great response and raised exactly what I needed to make the trip. The trip was an amazing experience and I am still processing all the ways it affected me. I am writing to share with you an exciting opportunity that has opened up to me. As you know I lived in the southeast of Mexico for seven lovely tropical years. The influence Mexico had on me and my artwork is obvious. I have a great love for the country, its people and culture. And of course my dear husband, children, and foster son were all born in Mexico. Living in Cancun and visiting Mexico City I had the opportunity to experience the very best Mexico has to offer. But as anyone who watches the news knows there are parts of Mexico that have huge problems with poverty, corruption and cartel-related crime. In my volunteer work with immigrant children here in Georgia it has been hard for me to reconcile the Mexico I know and love with the one they left behind. Their Mexico is so lacking in opportunity that families leave everything they know and risk their lives to cross to this country. For some time I have been anxious to have a better understanding of this other face of Mexico. This June I hope to have the chance to learn more first hand. My church, Mountain Lake Church, partners with a group called Hands and Feet that works with schools, orphanages and medical clinics in Piedras Negras, Coahuila, Mexico. A group of us from Mountain Lake will be going there on a mission trip to offer our help by offering medical clinics, building a cafeteria pavilion for a local school and by sharing the love of Jesus with children at orphanages and through a week of Vacation Bible School. I am so excited about the possibility of being able to help in some small way the people of the country that I love so much while at the same time learning more about the complicated issues Mexico and Mexicans face. Our group will fly from Atlanta to San Antonio, Texas and then cross the border by van and drive south about 2 and a half hours to Piedras Negras. 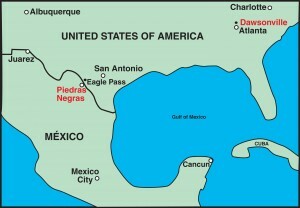 Though Piedras Negras is on the border it is not near Juarez where most of the cartel crime is centered. Hands and Feet have been working in the area for over 12 years and many groups like ours have visited without incident. We do not believe we will be in any danger but neither do we take our safety lightly and we hope you will pray for us and our trip. All of us going on this mission trip are sending out letters to our friends and family asking for commitments of prayer as well as financial support. Each of us needs $1300 to cover the cost of our transportation, lodging, food and supplies. To raise my portion I am offering prints of my painting “Light in Darkness” for $25. The painting is inspired by Matthew 5:14-16. The prints are 10×8 inches and come in 14×11 mattes with backing boards that will fit easily into a standard frame. I hope you will want to add one to your collection. If not I hope you will still commit to pray for me, the rest of my group, the people of Piedras Negras and Mexico in general. If you would like to donate directly to my trip’s fund instead of (or in addition to) buying a prints you can do so here. I would also love for you to leave me a comment below letting me know that I can count on you for prayers.